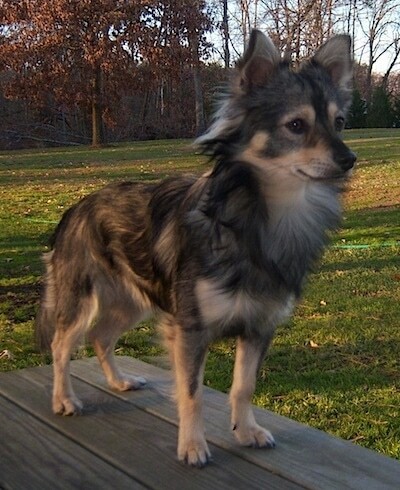 Lumpkin the American Eskimo / Chihuahua mix (Eskimo Chi) at 2 years old —"Lumpkin's mom is an American Eskimo and his dad is a black and tan long-haired Chihuahua. The owners of the parents said they think stairs were involved in the conception process! The litter contained 3 all white puppies and 3 darkly marked puppies. Lumpkin is a wonderful dog, and he's very devoted to my husband. He is also best buddies with our Shar Pei mix breed dog, Cheeks. Lumpkin is very smart. During his housebreaking period, twice he ran and got a tissue and placed it next to his poop accident!" The Eskimo Chi is not a purebred dog. It is a cross between the American Eskimo and the Chihuahua. The best way to determine the temperament of a mixed breed is to look up all breeds in the cross and know you can get any combination of any of the characteristics found in either breed. Not all of these designer hybrid dogs being bred are 50% purebred to 50% purebred. It is very common for breeders to breed multi-generation crosses.